She broadcast the whole thing on Facebook Live. Shailene Woodley has been released from jail after her arrest on Monday. The 24-year-old actress was among around 100 demonstrators who staged the peaceful protest in Sioux County on the construction site of the Dakota Access Pipeline, which will transport crude oil from North Dakota to Illinois, on Monday morning. Divergent star Shailene and a number of other protesters were subsequently arrested following a confrontation with authorities. The incident was broadcast on Facebook Live, with footage showing the actress as she demanded to know why she was one of few being taken into custody, when so many others had been trespassing, too. She also insisted she had moved off the land when police asked her to. Shailene was taken to Morton County Jail after her arrest, and was released hours later. Following her release, her representative told E! News in a statement: "She appreciates the outpouring of support, not only for her, but more importantly, for the continued fight against the construction of the Dakota Access Pipeline." The pipeline plans have caused controversy as it interferes with sacred Native American territory and burial grounds. The gathering at Standing Rock took place a day after judges at a U.S. Federal Appeals Court rejected calls to halt the building of the pipeline. Early on Monday, Shailene took to Facebook and shared a video of herself en route to Standing Rock as she prepared to put up a fight. 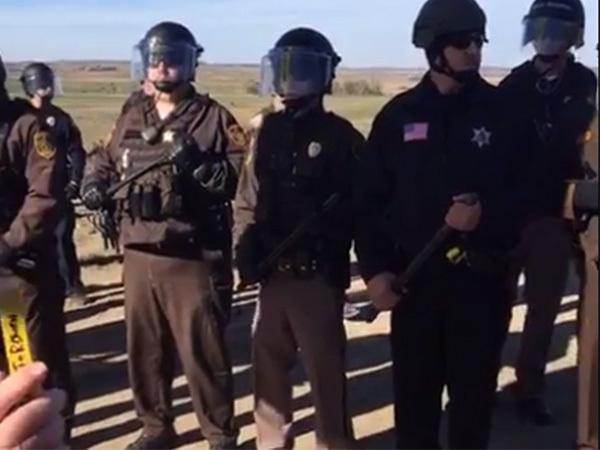 She captioned the footage, "Back at standing rock. Last night, US court of appeals decided to deny injunction to halt #DAPL construction. On our way to the front lines now." Shailene has been campaigning against the Dakota Access Pipeline for months, and previously joined Daredevil star Rosario Dawson at a protest in New York in August (16), when they held up signs and marched with others committed to halting the project.